Take a dive into the water and join your new dolphin friends at this Six Flags Mexico Dolphin Swim. Here you have the opportunity to swim with, hug, and give a handshake to gorgeous and playful dolphins. These fun marine mammals are ready to say hello and give you their famous foot push. 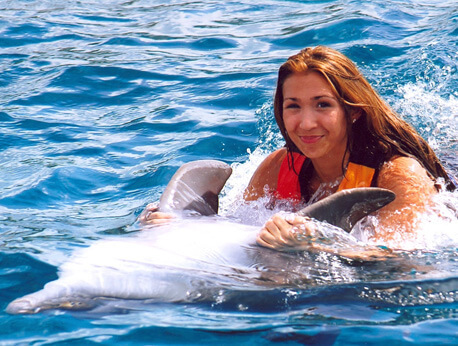 At Six Flags Mexico Dolphin Swim, you will be able to take a swim with cheerful dolphins. These marine mammals are known to plant a kiss on you, share a hug, give you a handshake, and even nudge you for a foot push. The foot push is famously known as a gentle push by two dolphins on the bottom of your feet as they guide you through the water and bump you into the air. In addition, these excited creatures love to have fun and provide an excellent learning experience. This experience will grant you the opportunity to greet new energetic friends and check off swimming with dolphins on your bucket list. You’ll also be able to able to further maximize this experience by remaining in small group of no more than 12 people. Here, you all can swim around, take memorable photos, and enjoy the fun throughout this incomparable activity. Even children are allowed to join in on the fun. These loving marine animals are perfectly safe for children to swim around with. In fact, dolphins are gentle and make great companions for swimming. The cute creatures also have an adorable voice that can bring children to laughter. It is hard to pass up a chance to swim with dolphins, especially with all their great qualities. Dolphins are extremely intelligent, and are even considered by scientists as the second most intelligent mammal. In addition, they have been known to be incredibly friendly and perfect companions for swimming. In all, when traveling to Six Flags Mexico, remember to join the Dolphin Swim for a one of a kind experience. If you have ever wanted to meet and swim with a dolphin, then this is your chance. Book your tour today to experience these majestic creatures in a close, safe, and beautiful environment.